An ultra-luxe, vegan magnetic makeup palette designed by YouTube personality and celebrity makeup artist Kiki G. The Palette securely (and beautifully) holds your favorite makeup, brushes, pencils, domed powders and more. It's the perfect palette for people who like pretty makeup, smart things and obsessive organizational abilities. 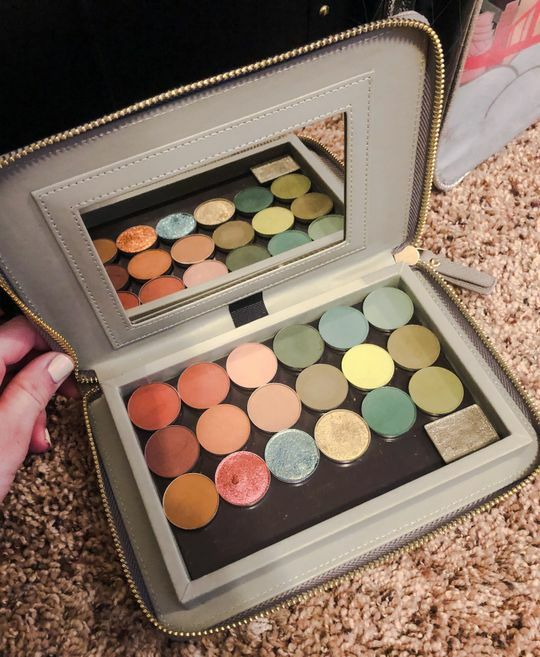 Interior of magnetic base: 6.25"x3.8"x.4"
Ashley N. Reviewed by Ashley N.
I love this palette! It’s beautiful and sturdy. I leave it out on my vanity because I love how aesthetically pleasing it is. Definitely buying the French gray so I can separate my creams and powders. Jenn K. Reviewed by Jenn K.
Salt's well-made, yet simplistically beautiful palette has stepped up the game for the entire makeup industry. This palette allows you to depot makeup, repurpose old packaging, and consolidate your collection in style. Very impressed with my Salt palette - ADORE! Cordelia S. Reviewed by Cordelia S.
i'm a mom on the go and needed a bigger, safer option than the normal magnetic pallet closure options for traveling around. I often do make up in the kitchen, in the car, on the couch, wherever i get a free min and decent lighting. This has been a great help because of the room for pans and the 'double' closure (magnetic AND zipper). i keep it flat in a make up, because not everything is indestructible, but i know it's not going to just pop open and scratch all my pretty pans! Marianne P. Reviewed by Marianne P.
I purchased two palettes. They will be great when traveling! !